On the afternoon of October 12, Chinese Premier Li Keqiang met with Afghanistani CEO Abdullah in Dushanbe. The two leaders exchanged views on further deepening bilateral relations and topics of common interests. Li Keqiang said that China hoped that the security situation in Afghanistan will be improved and create a peaceful and stable environment for Afghanistan development. And China is willing to further strengthen cooperation with Afghanistan in the fields of economy, trade, power generation, agricultural products and anti-terrorism. China is also willing to provide support and assistance on these fields. On these bases, China will promote the tripartite cooperation between China, Afghanistan and Pakistan and deepen cooperation between the two countries in regional affairs. The ancient Chinese civilization is located in the eastern part of the Eurasian continent, but the history of communication and exchanges with the central and western civilizations of the Eurasian continent has never ceased. The “Silk Road” has become a symbol of the eclectic and inclusive Chinese civilization. Among them, Afghanistan, located in the heart of the “Silk Road”, witnessed friendly exchanges between China and Afghanistan. Nowadays, China and Afghanistan have steadily advanced their cooperation under the “One Belt and One Road” Initiative. Politically, China established a strategic partnership with Afghanistan in 2012. In 2014, China and Afghanistan decided to further deepen their strategic partnership. The two countries have frequent high-level interactions. And the leaders of the two countries have held consultations on multilateral and bilateral occasions and exchanged views on bilateral issues of mutual interests to support and understand each other’s decisions on major issues. Economically, Afghanistan has formulated a comprehensive plan to link up the “One Belt and One Road” Initiative. 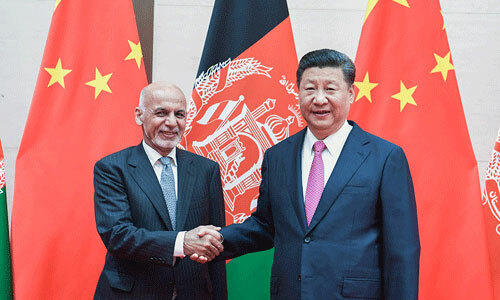 And China supports powerful Chinese-funded enterprises to participate in infrastructure construction in Afghanistan and promote the interconnection and intercommunication between Afghanistan and other countries. In safety, Zhang Qian visited Afghanistan in order to unite the Great Moon to deal with the Huns in the north in ancient times, while China supports the Afghan National Unity Government to safeguard national security and stability, and promotes the political reconciliation process of “Afghanistan-led, A-human-owned” and is willing to continue to play a constructive role in this regard nowadays. The Community of Human Destiny aims to balance the legitimate interests of other countries in pursuing its own interests and promote the common development of all countries in the pursuit of national development. China and Afghanistan are neighbors. The proximity of the two countries mean that the fate of China and Afghanistan is closely linked. The community of human destiny is a community of destiny for China and Afghanistan. The “One Belt and One Road” Initiative demonstrates the vision of cooperation between Afghanistan and China, especially in the interconnection and construction of Urumqi-Kabul route, China-Africa freight direct train opening, etc., which has pushed China has become Afghanistan’s largest source of investment and the third largest trading partner. Moreover, the China-Pakistan Economic Corridor extends to Afghanistan and connects Afghanistan with the China-Central Asia-West Asia Economic Corridor, making Afghanistan an important hub for the “One Belt and One Road” to connect South Asia, East Asia and West Asia. Closing economic and trading ties provide an opportunity for China and Afghanistan to deepen political mutual trust, strengthen security and cultural exchanges, and provide opportunities for two countries to build a community of human destiny. China and Afghanistan actively use multilateral occasions to hold meetings of leaders, which is conducive to strengthening political exchanges, mutual political trust, and promoting the development of bilateral relations between the two countries. During this meeting, the leaders of the two countries reached an agreement on the realities of China and Afghanistan and reached consensus on the future development. China will actively assume its international responsibilities and will play a more active role in the reconstruction of Afghanistan and promote the common interests of the two countries. And these strengthen the all-round, multi-disciplinary and in-depth construction and cooperation between China and Afghanistan.